“stomach-punch” game. Carl Crawford hit a double in the 9It’s funny but sad. Losing a lead in the 8th or 9th inning should be the worst way to lose a game. The Devil Rays bullpen blows so many leads late in games, that when they do, it is never very painful. It is almost expected. Last night, however, was painful. A classicth inning with the score tied 2-2 that would have given the Rays men on second and third with no outs. 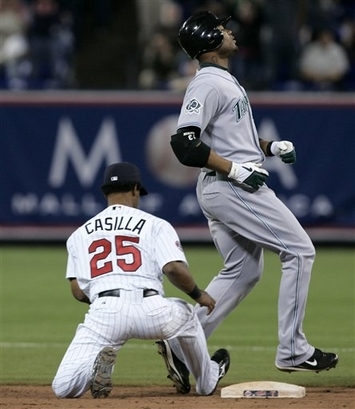 Instead CC, who is pre-programmed to hit triples, kept on running, and ran the Rays right out of the inning. The Rays would lose in the bottom of the 9th on a Justin Mourneau walk-off home run 3-2. That was a painful way to lose. However, Crawford’s base running blunder in the 9th was only part of it. The Rays wasted a solid performance by Casey Fossum. Those don’t come all very often. It is is sad to see one slip away. Joe Maddon now has Rocco Baldelli leading off and Carl Crawford hitting third. OK, no big deal. So why are we mentioning it again? Because of this quote that made us chuckle..
Before the game Joe Maddon said that he was very interested to see how well Casey Fossum would pitch. That sounds as if Papa Joe is contemplating Fossum’s position in the rotation. Tonight Scott Kazmir will take the mound for the second straight appearance and go head-to-head with a Cy Young winner. Last time out it was Roy Halladay. This time it is Johan Santana. BJ Upton and his brother Justin got their love of baseball from their father. This piece also touches on potential reasons why BJ is one of so few African-Americans in the game today. In fact the Devil Rays have more African-Americans on their roster (6) than any other big league club. In their first 81 plate appearances, Delmon Young, Rocco Baldelli and BJ Upton have combined for 4 walks. Jayson Stark notes that this came after Joe Maddon instituted mandatory pitch counts for batters in the spring. A Twins fan has put together a collection of Devil Rays mugshots. We are not quite sure why we find the collection so interesting, although in a few instances the writer has included images from multiple seasons and the changes seem fascinating to us. For example, you can really see how Dioner Navarro has slimmed down in 2007. A lot has been made of the two caught steeling attempts by Carl Crawford. It appears as though the Rangers may have watered the area around first base a little too much.